No, not in the tabloid newspaper sense of the word, but a pretty awesome band I just heard for the first time today. Ok, a little behind the times some might say, but I just heard them today and felt compelled to write. You can check out their latest single "Standing In The Way Of Control" (taken from the album of the same name) below. I love the fact that they have a great indie/punky sound, but with a great soulful vocal with attitude. 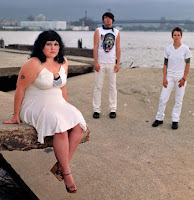 More info on their official website: www.gossipyouth.com, their myspace page, and their Wiki entry. If you like the single, I highly recommend checking out the album, which you can buy from Amazon here.